Well before the Normandy Invasion (6 June 1944), the most fraught contention between the British and Americans was the prosecution of the war elsewhere in Europe: the “Third Front,” so to speak, after Normandy and the Soviet onslaught in the east. Newly published, The Churchill Documents: Normandy and Beyond, May-December 1944, offers fresh insights into what was either the signal Anglo-American mistake of the war or the only way to a speedy victory. The differing strategic outlooks of British and American war leaders arose again over the second invasion of France. 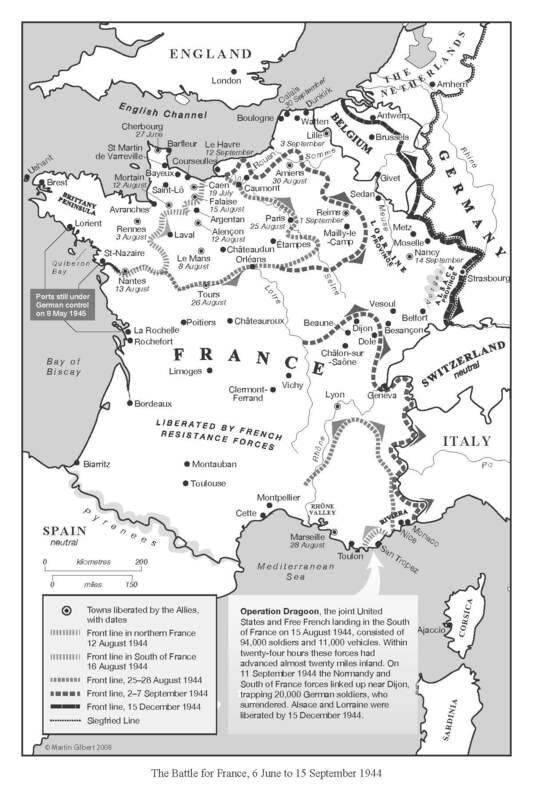 The Americans favored Operation Anvil, later renamed Operation Dragoon, an invasion into the south of France somewhere near Marseille. 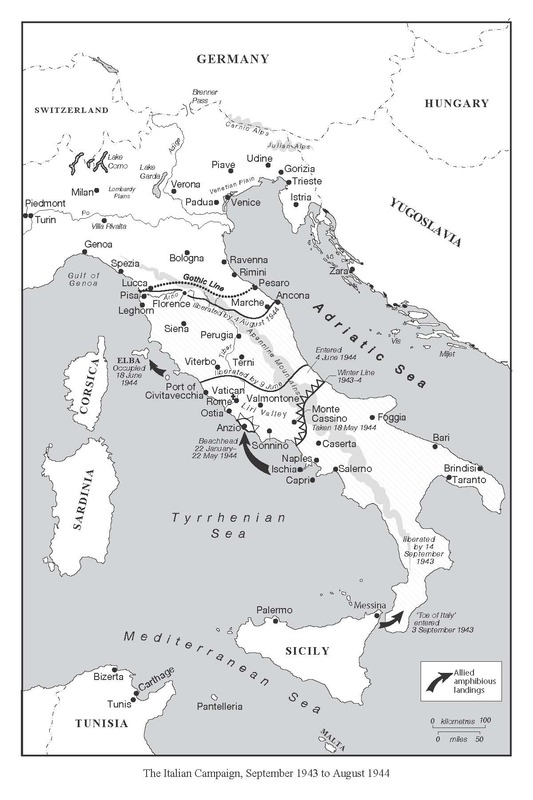 Churchill favored reinforcement of British and American forces in Italy and the support of them by amphibious landings at points as far east as the Aegean. Churchill and the British chiefs believed that the location for “Anvil” was too far from Eisenhower’s forces to be of use. American forces were growing faster than the British, and the United States had a monopoly at that time on the production of landing craft: therefore “Anvil / Dragoon” became the policy. The invasion commenced on August 15th. Normandy and Beyond documents in unprecedented detail the arguments between Washington and London up to and after Operation Anvil. The Americans made the obvious point that between Italy and Germany were the Alps. Yes, there was the Ljubljana gap or pass through the mountains towards Vienna, but the Germans might not find it difficult to obstruct just one pass. Allied offensives in Italy had seldom found it easy going, least of all when mountains were involved. Note: For purposes of these excerpts, we omit footnotes and source references while inserting biographic links for online readers. For these and the vast supporting and surrounding material, we recommend the volume itself, available from the Hillsdale College Bookstore. After the war, Churchill was distressed over rumors that he was averse to the invasion of France. It “may be convenient,” he wrote in Their Finest Hour, “if I make it clear that from the very beginning I provided a great deal of the impulse and authority for creating the immense apparatus and armada for the landing of armour on beaches, without which it is now universally recognised that all such major operations would have been impossible.” Churchill had been demanding plans for re-establishing “a lodgement on the continent” almost since the Anglo-French armies quit Dunkirk in 1940. But he was not willing to repeat the mistakes of the Dardanelles landings of 1915, for which he’d been unfairly blamed. Once landed, he believed any “lodgement” must be exploited to the full. Mr. Churchill said that the American attitude had always been for a great campaign in France…. The campaign in the Mediterranean had been continued on the understanding that in 1944 the assault on North-Western Europe would take place, and Stalin had also pressed for this…. [The Americans] had always been reluctant to take advantage of success in the Mediterranean….They had asked us to agree to break off the Italian campaign as soon as we had joined up the main front with the bridgehead. This we had found ourselves unable to agree to, as we felt that it would be utterly wrong to draw back in the full tide of battle. The Americans had been somewhat inclined to treat the question in a bargaining spirit, but there were signs that they would relent. Churchill was mistaken. Roosevelt had never deviated from his 1943 view that everything was subordinate to Normandy. Two weeks after Normandy, however, Mediterranean Commander General Sir Henry Maitland Wilson appealed to Supreme Commander General Eisenhower to consider the opportunities. Wilson admitted that “Anvil,” the landing east of Marseille between Toulon and Cannes, was the best option in France. Given the delay of further U.S. troops, however, it could not be launched for three months. Were there better options? Wilson thought so. …in my opinion the course that holds out the best chance of really decisive results in this theatre is to exploit the present success in Italy through the Pisa–Rimini line across the Po and then to advance towards Southern Hungary through the Ljubljana Gap [between June and September]. … By early August, therefore, [the enemy] must either allow our offensive in Italy to develop to a point at which it constitutes a serious threat to the Danube Basin—one of the most vital areas—or bring in substantial forces to reinforce his position in Italy. I estimate that, bearing in mind the losses which the enemy will suffer in the breaking of the Pisa–Rimini line, to forestall any advance beyond the Po he would require to introduce not less than 10 new divisions into Northern Italy and even then there is no reason to suppose that he could stop the advance…. [The plan] is well within the administrative capacity of this theatre and once we have secured Trieste and Venice in addition to the other ports in Northern Italy we should be well able to accept a considerable number of fresh divisions direct from the United States, should it be decided to make them available for this purpose. …the Combined Chiefs of Staff have long ago decided to make Western Europe the base from which to conduct decisive operations against Germany. To authorize any departure from this sound decision seems to me ill advised and potentially dangerous. In my opinion, to contemplate wandering off overland via Trieste to Ljubljana repeat Ljubljana is to indulge in conjecture to an unwarrantable degree at the present time. Certainly it involves dispersion of our effort and resources. Even granted successful achievement of this objective by autumn, I am unable to repeat unable to see how the over riding necessity for exploiting the early success of “Overlord” is thereby assisted. [We must seize] ports quickly in France through which the weight of our forces can be poured. We must concentrate our forces to the greatest possible degree and put them into battle in the decisive theatre. To do so they must all land in France and work toward a common center. Overlord is the decisive campaign of 1944…. Our forces in Italy do not directly threaten any area vital to the enemy…. An advance on Ljubljana and Trieste would probably contain a considerable amount of German strength, but there would be no guarantee that it would divert any appreciable number of German divisions from France. Neither would it give us an additional port [and it] would have little positive effect until 1945. I, therefore, recommend “Anvil.” General Wilson is fully prepared to carry out “Anvil” if the decision is made to do so. This opens up another gateway into France, which, if not the best in geographical location, is the best we can hope to obtain at an early date. The possession of such a gateway I consider vital. It was time for Churchill to enter the argument again. He did so in a long appreciation of the European theatre, telegrammed direct to Roosevelt. He used the term “overall strategic concept,” which he knew Americans liked—he would use it again at Fulton in his “Iron Curtain” speech two years later. Churchill agreed that the supreme project should be “Overlord,” the invasion across France. Ports were needed to reinforce its troops, but “many small ports” with high capacity already existed on the Normandy coast. The major ports of Le Havre and St. Nazaire would soon be taken, he said. Moreover, only seven American divisions were due to arrive in June, July, and August. Were more ports in the South of France not therefore superfluous? To sum up: (a) Let us reinforce “Overlord” directly, to the utmost limit of landings from the west. (b) Let us next do justice to the great opportunities of the Mediterranean Commanders, and confine ourselves at this phase to minor diversions and threats to hold the enemy around the Gulf of Lions. (c) Let us leave General Eisenhower all his landing craft as long as he needs them to magnifying his landing capacity. (d) Let us make sure of increasing to the maximum extent the port capacity in the “Overlord” battle area. (e) Let us resolve not to wreck one great campaign for the sake of winning the other. Both can be won. Roosevelt often let days go by before replying to Churchill, but now he wasted no time, responding by telegram the very next day. I agree with you that our over-all strategic concept should be to engage the enemy on the largest scale with the greatest violence and continuity, but I am convinced that it must be based on a main effort together with closely co-ordinated supporting efforts directed at the heart of Germany. [“Overlord,” “Anvil,” the present Italian campaign and Soviet advances in the east] all as envisaged at Teheran – will most surely serve to realize our object, – the unconditional surrender of Germany…. The Forces we are sending [Eisenhower] from the United States are what he has asked for. If he wants Divisions ahead of service troops he has but to ask—the Divisions will be ready. Until we have exhausted the forces in the United States, or it is proved we cannot get them to Eisenhower when he wants them, I am opposed to the wasteful procedure of transferring forces from the Mediterranean to “Overlord”…. . My interest and hopes center on defeating the Germans in front of Eisenhower and driving on into Germany, rather than on limiting this action for the purpose of staging a full major effort in Italy…. I cannot conceive of the Germans paying the price of ten additional Divisions, estimated by General Wilson, in order to keep us out of Northern Italy…. [As regards] a campaign to debouch from Ljubljana Gap into Slovenia and Hungary…would seem far to exceed those pictured by you in the Rhone Valley [and] for purely logistical reasons it is doubtful if, within a decisive period, it would be possible to put into the fighting beyond the Ljubljana Gap more than six Divisions. Meanwhile we will be struggling to deploy in France thirty-five US Divisions that are now in continental United States…. I cannot agree to the employment of US troops against Istria and into the Balkans nor can I see the French agreeing to such use of French troops. Those two statements really said it all, politically if not strategically. Roosevelt was still basing his plans on the hope of Soviet cooperation, not only in the final end of the Hitler regime, but the postwar arrangements in Europe. These proved to be forlorn hopes. Yet who is to gainsay him as things appeared at the time? Hindsight is a wonderful teacher. Churchill, however, foresaw the future if Stalin was given a free hand in Eastern Europe. He replied with regret and sorrow. The splitting up of the campaign in the Mediterranean into two operations, neither of which can do anything anything decisive, is, in my humble and respectful opinion, the first major strategic and political error for which we two have to be responsible. At Teheran you emphasized to me the possibilities of a move Eastward when Italy was conquered and mentioned particularly Istria. No one involved in these discussions has ever thought of moving armies into the Balkans; but Istria and Trieste in Italy are strategic and political positions, which as you saw yourself very clearly might exercise profound and widespread reactions, especially now after the Russian advances. What can I do, Mr President, when your Chiefs of Staff insist on casting aside our Italian offensive campaign, with all its dazzling possibilities, relieving Hitler of all his anxieties in the Po Basin…and when we are to see the integral life of this campaign drained off into the Rhone Valley in the belief that it will in several months carry effective help to Eisenhower so far away in the North? If you still press upon us the directive of your Chiefs of Staff to withdraw so many of your forces from the Italian campaign and leave all our hopes there dashed to the ground, His Majesty’s Government, on the advice of their Chiefs of Staff, must enter a solemn protest. I need scarcely say that we shall do our best to make a success of anything that is undertaken. We shall therefore forward your directive to General Wilson as soon as you let us know that there is no hope of reconsideration…. It is with the greatest sorrow that I write to you in this sense. But I am sure that if we could have met, as I so frequently proposed, we should have reached a happy agreement. I send you every personal good wish. However we may differ on the conduct of the war, my personal gratitude to you for your kindness to me and for all you have done for the cause of freedom will never be diminished. The one thing to fight for now is a clean cut so that Alexander knows what he has and we know what we have a right to give him. Let them take their 7 divisions – 3 American and 4 French. Let them monopolise all the landing craft they can reach. But let us at least have a chance to launch a decisive strategic stroke with what is entirely British and under British command. I am not going to give way about this for anybody. Alexander is to have his campaign. If the Americans try to withdraw the two divisions still left with him, I shall ask you to send the 52nd division from the United Kingdom to breach the gap. I hope you realise that an intense impression must be made upon the Americans that we have been ill-treated and are furious. Do not let any smoothings or smirchings cover up this fact. After a little, we shall get together again; but if we take everything lying down, there will be no end to what will be put upon us. The Arnold–King–Marshall combination is one of the stupidest strategic teams ever seen. They are good fellows and there is no need to tell them this. We should concentrate the greatest possible force in the shortest possible time in what is clearly the decisive theatre. The campaign in Italy is slowing down, the Dragoon landing place is a long way from the main battle in Northern France and under the most favourable conditions the build-up that will be necessary before rapid advance can be carried out from the south of France must take time. It may be two or even three months before the Dragoon divisions join in the battle in central France…. The United States Chiefs of Staff adhered firmly to the views they had expressed…. To make a change now would be to cause the utmost confusion everywhere and in the event we might well fall between two stools. The impression…seemed to the United States Chiefs of Staff to confirm this view. We could not budge them. Operation Dragoon (renamed from Anvil) was launched on August 15th. 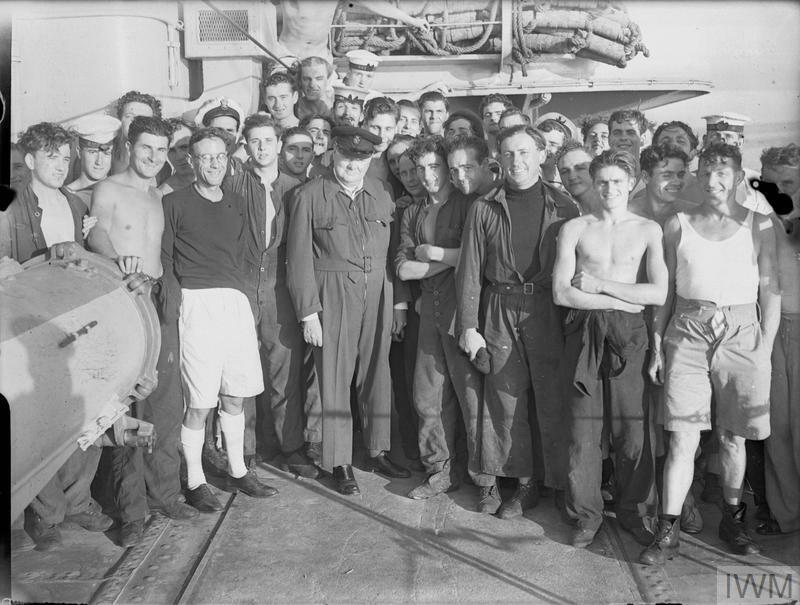 Giving every indication of enthusiasm, Churchill observed operations aboard HMS Kimberley. The Germans resisted strongly, but ultimately lost critical tank battles and quickly began falling back. The invaders captured the southern French ports Eisenhower wanted but Churchill thought unnecessary. Toulon fell on the 21st, Marseille on the 27th. So far the “Anvil” abortion has had the opposite effects for which its designers intended it. First it has brought no [German] troops away from General Eisenhower at all. On the contrary, two and a half to three German Divisions of the rearguard will certainly reach the main battle front before the Allied landed troops. Secondly the breaking in full career of these two great armies, the 5th and the 8th, and milking out of the key personnel in them has enforced stagnation here which has led to the withdrawal of three German Divisions from the Italian front including one very strong Panzer of 12,500 active strength. These have gone straight to the Chalons area [near Reims]. Thus about five divisions have been brought against Eisenhower which would not have happened if we had continued our advance here in the direction of the Po and ultimately on the great city. I still hope that we may achieve this. Even if the war comes to a sudden end there is no reason why our armour should not slip through and reach it as we can. Nevertheless the advance up the Rhone Valley was relatively steady, convincing the Germans to dismantle the Vichy government. Bordeaux was evacuated at the end of August, and the French Resistance liberated large swathes in the French southwest (see map). But Churchill retained his misgivings about the strategy. The PM, with temperature normal, is in tearing form…he thinks the grand strategy will be highly approved, though there may be an undistinguished minority who proclaim we ought to have invaded in 1943. He told me it had been like a bull-fight: “Torch” [invasion of North Africa] “Husky” [Sicily] etc. were like the preliminary the Picadors, the banderillas etc. Then came “Overlord” [Normandy] the Matador coming at the crucial moment to make the kill waiting till the bull’s head was down and his strength weakened. But “Dragoon,” the landing in the South of France, has been a pure waste: it has not helped Eisenhower at all and, by weakening Alexander’s armies, has enabled the Germans to withdraw troops from Italy to Northern France. Thanks to the skill with which it was mounted and carried through by all three services Operation “Dragoon” has been an outstanding success. Once ashore the skill of the commanders combined with the determination and speed of manoeuvre of all forces coupled with effective assistance from the FFI [French Forces of the Interior, part of the French Resistance] have produced a situation in which the whole of Southeastern France east of the Rhone and south of Lyons as far east as Nice is under the control of the Allied armies. Some 50,000 prisoners have been captured and very heavy losses have been inflicted on the enemy through some (1½) divisions have escaped to the North after having suffered heavy losses in men and material. The Prime Minister suggested that if the present offensive was stopped in the Appennines, the effort might be switched to Istria….Sir John Cunningham pointed out that these landing craft would have to be moved 1000 miles, and must have three weeks for refitting…. Sir Alan Brooke pointed out that [if] we suggested withdrawing formations [from the Italian front] for what the Americans would term a “Balkan venture” they would say that they ought rather to be sent to the main front in France. They would say the same about the landing craft, which they were anxious to remove to the Pacific…. The Prime Minister suggested that the amphibious operation might be launched against the North East coast of Italy, behind Kesselring. Sir John Cunningham said that there were no suitable beaches between Ancona and Trieste. Moreover, the water was heavily mined, and was shallow, and there were a large number of lagoons which would make the penetration inland very difficult…. The Prime Minister said that it would be most valuable if General Marshall could be got to visit the Italian front. The whole position could be put to him frankly, and it could be pointed out to him that with two or three extra divisions great results might be achieved in beating Kesselring, and thus preventing the withdrawal of German troops for France or Russia. Sir Alan Brooke said that the difficulty about making the case would be the date by which these divisions could arrive. Provision of additional US divisions will not affect the campaign in Italy this year. All of us are now faced with an unanticipated shortage of manpower and overshadowing all other military problems is the need for quick provision of fresh troops to reinforce Eisenhower in his battle to break into Germany and end the European War…. Diversion of any forces to Italy would withhold from France vitally needed fresh troops while committing such forces to the high attrition of an indecisive winter campaign in Northern Italy. I appreciate the hard and difficult task which our Armies in Italy have faced and will face, but we cannot withhold from the main effort forces which are needed in the Battle of Germany. Our Armies in Italy were delayed by “Anvil” and greatly weakened for its sake. Consequently we cleared the Apennines only to find the valley of the Po a bog. Thus both in the mountains and on the plains our immense armour superiority has been unable to make itself felt and now the bad weather in Italy, as on the Western front, greatly diminishes the tactical Air power in which we have so great a predominance. Hitherto in Italy we have held 28 German divisions and therefore no reproach can be made against our activities. On the contrary, General Marshall is astonished we have done so well. This is only however because the Germans have delayed a withdrawal through the Brenner and the Ljubljana presumably in order to bring their forces home from the Balkans. We cannot look for any very satisfactory events in Northern Italy at present though we are still attacking. No other Western campaign cost more than Italy in terms of lives lost and wounds suffered by the infantry of both sides, especially around strong points at the Anzio beachhead and the Gothic Line. The campaign ended only when German Army Group C surrendered unconditionally to the Allies on 2 May 1945, a week before the general surrender. My dear Ike…. We were so often in full agreement that the tale of our relations should be easy and agreeable for each of us to tell. The only point about which I was unhappy at the time was your inability to give me the help I needed to take Rhodes in the autumn of 1943. I still hold to the view I took then, but I quite understand your difficulties. As you know, I did not agree with “Anvil,” which was launched in 1944, as I thought it too far to assist you in your Normandy struggle. As things turned out it was you who helped “Anvil” and not “Anvil” which helped you. However these are matters on which only another generation can pronounce. It is a great joy to me to see our two countries working together ever more closely. In this alone lies the salvation of the world. I feel we shall always be marching together along that road. You cannot be expected to gloss over your dislike of “Anvil” or your attempts to stop it. The differences of view about it were fully disclosed in Eisenhower’s own book. Nor should you conceal your view that, looking back, you were right. It is not fair to say…that the victory was “a final argument” in favour of “Anvil.” Your case is that “Overlord” could have succeeded without “Anvil” which, by drawing off resources, prevented Alexander from exploiting other and additional possibilities in Italy and the Balkans. The fact is that Eisenhower was arguing from the point of view of a theatre commander, concerned only with the battle in North West Europe. You were looking at this then, and are writing of it now, from a wider strategic angle…. It is significant that Eisenhower should have said in his book that on this point “the United States Chiefs of Staff, following their usual practice, declined to interfere with the conclusions of the commander in the field” and left it to him to argue with you. This is tantamount to saying that the United States Chiefs of Staff abrogated any strategic interest in any European theatre except the North West. “History with its flickering lamp stumbles along the trail of the past,” Churchill said, “trying to reconstruct its scenes, to revive its echoes, and kindle with pale gleams the passion of former days.” We cannot know the outcome of alternative history. The judgment must rest as Churchill said with future generations. Normandy and Beyond affords us a unique glimpse of that great controversy.